Patrick Allen, Conductor, Harpsichordist, and Organist is a native of Tallahassee, Florida. 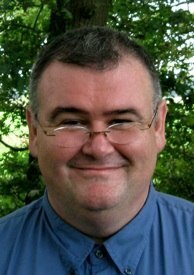 He has served as Organist and Master of Choristers at Grace Church in New York since March of 2000. In addition to his work training the choristers, conducting the Choir of Men and Boys, Girls’ Choir, Parish Choir and Adult Choir, and supporting the liturgies of Grace Church, he founded and plays the “Bach at Noon” and “Weekend Organ Meditation” series at the Church. Combined, live organ music is offered to the community as meditation six days a week from September through May. Since the fall of 2015, Allen also serves as organist for the Chapel of the Good Shepherd at The General Theological Seminary. Allen has received degrees from the University of North Texas and The Florida State University. He was awarded the degree Doctor of Musical Arts and The Performer’s Certificate in Organ from the Eastman School of Music where he studied with Russell Saunders. In Amsterdam, Allen worked with Gustav Leonhardt, Max van Egmond, and Veronika Hampe. In 1988 he was a finalist in the American Guild of Organists National Open Young Artists Competition. He has been heard as soloist on the organ and harpsichord and in many chamber music programs throughout the United States and Europe. With the Choir of Men and Boys and Girls’ Choir of Grace Church he has toured Austria, the Czech Republic, France, Italy, the Netherlands, Spain and the United Kingdom. Allen has recorded with The Saint Thomas Choir on the Koch and Priory labels. “A Still, Small Voice of Calm: Pastoral Work within the Children’s Choir,” Patrick Allen, The Journal of the Association of Anglican Musicians, Vol. 11/4, April 2002. In September of 2014 Grace Church in New York and the Yale University Institute of Sacred Music entered into a new collaboration for the annual Organ Scholar appointment at Grace Church in New York. This appointment will be made for one academic season with the provision that it may be renewed for a second season. The internship will provide an exceptional opportunity for a graduate student at the Institute of Sacred Music to participate in the life of the parish on a weekly basis during the academic year and a more in depth daily experience for the summer term that follows. As part of an intensive, on-site learning experience, the intern will share in service playing and choral conducting responsibilities while at the same time learning about all aspects of the musical life of the Grace Church community. Appointed in the fall of 2017, The 2018-2019 Organ Scholar at Grace Church is Jacob Reed. This is the second year of Mr. Reed’s appointment. Jacob Reed is a Master’s student at the Yale Institute of Sacred Music, where he studies organ with Martin Jean. Born in Oxford, England, and raised in Chapel Hill, North Carolina, he recently became the first student ever to receive a simultaneous BA/MA in musicology from Yale University (double-major in mathematics), studying harpsichord with Arthur Haas and organ with Thomas Murray. Jacob was a 2013 U.S. Presidential Scholar, and was selected as a 2013 YoungArts National Finalist by the National YoungArts Foundation – one of 152 finalists out of nearly 10,000 applicants, and the only organist among the 19 classical musicians. Over the past several years, he has given recitals across the United States, Europe, and Canada. 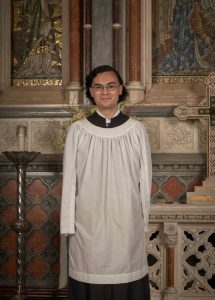 In addition to his solo, ensemble and church service playing as an organist, Jacob has also performed frequently as a soloist, accompanist, and chamber musician on piano, harpsichord, and viola da gamba. Since matriculating at Yale, he has been a member of the Yale Temperament Viol Consort, instrumentalist and vocalist for the Yale Collegium Musicum, and first harpsichordist for the Yale Baroque Opera Project. Jacob was artist-in-residence as organist and pianist at the 2016 and 2017 iterations of the Uncommon Music Festival in Sitka, Alaska.